Context Free is software that you can use to generate fascinating art work. You give instructions using code called a "grammar". It's quite a neat way to bring together math, art and programming, which are key STEM skills. The Context Free Art site provides downloads of the (free) software (Mac, Windows and Linux), and also a gallery of around 1000 works of art generated using the program. Everything is released using a Creative Commons non-commercial license, so you can use the images in your own work. You can modify other people's code to create your own materpieces (but give credit to the original, of course). 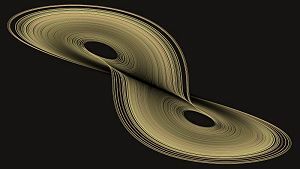 Here's a useful list of resources by Mikael Hvidtfeldt Christensen: Generative Art Links, containing links to some interesting software for creating several different types of math art, including 3D fractals, and there's also some interesting blogs.